In this paper, we have developed a unified theory of (i) how Consciousness devolves into the cosmic mind, how the cosmic mind expresses into the five fundamental factors, providing the constituents of the physical universe, how the universe comes into being and what constitutes the invisible universe (dark matter and dark energy); (ii) how life forms: how following the big bang the matter structure (of fundamental particles) gets energised by microvita, by means of synthetic reactions, to develop an organised physical (organic) structure and manifest a biopsychic field, representing a primitive (unit) mind; (iii) how the primitive mind evolves into a more complex and subtle mind of a human being; (iv) how the psychic impressions on the human mind lend a characterizing property to the mind, which dictates the nature of human response to the environment, in the form of human behaviour. and sentiments (such as joy or sorrow, kindness or anger); (v) how psychic rejuvenation can be brought about by mental stimulation of the psychic glands (or cakras), by means of psychic (and acoustic) mantras, having the ideation of consciousness; (vi) how this results in dilation of mind and defacing of these psychic propensities, and how by this ongoing effort, the mind can be liberated from its psychic propensities (Refs. 1 -5). In the last seventy years, the theory of Relativity has altered our views of space and time, while Quantum theory has necessitated a new conception of the nature of matter and energy. Yet, even earlier than that, Max Planck had indicated that he regarded consciousness as fundamental and matter to be a derivative of consciousness. According to him, we cannot get behind consciousness; everything we talk about, everything we regard as existing, postulates consciousness. The Fundamental Entity: In this new Science paradigm, the first and foremost is the concept of Absolute consciousness (or Consciousness), as the fundamental entity, incorporating the Cognitive and Operative principles. Starting from here, the trail of the Cosmological cycle is summarised in Table 1 and illustrated in figure 1. Stage 1, Development of Cosmic mind: The next event is thatConsciousness devolves into Cosmic Mind, and Cosmic Mind devolves into matter (Refs 1-3). How? Through the Operative principle, the Cosmic mind gets expressed into the five fundamental (ethereal, aerial, luminous, liquid and solid) factors, providing the constituents of the physical universe. These five fundamental factors are understood to be a spectrum of wave forms described as ethereal, aerial, luminous, liquid, and solid Factors (in order of decreasing wavelength). These 5FFs are associated with sensory properties, For example, the Ethereal factor carries the ‘sound’ sensory attribute, the origin of the primordial sound. The aerial factor carries the ‘sound’ and ‘touch’ attributes. The Luminous factor carries the sound, touch and light sensory attributes; the Liquid factor carries sound, touch, light and taste attributes. The Solid Factor carries the sound, touch, light, taste and smell attributes. All these five factors are formed by the pressure of the Operative principle. As the factors get formed, they can form structures which are (i) visible if they also contain the liquid and solid factors, and (ii) invisible if they contain only the ethereal, aerial and luminous factors. Now, as a result of this pressure on the structure made up of the solid factor as well, two opposing forces develop: one exterior or centrifugal with a fissiparous tendency and the other interior or centripetal to maintain its solidarity. The collective name of these two exterior forces is prana or energy. If the interior force is the resultant, then a nucleus is formed within the solid factor and a solid structure is formed, and its solidarity is maintained (Ref 1). These physical solid structures are composed of all the five fundamental factors with their respective nuclei. The controlling nucleus of all of these fundamental physical nuclei is the controlling point of their collective prana, known as pranah or vital energy. Under the influence of the resultant interior force associated with the congenial environment of pranah, a portion of the physical solid structure gets pulverised and transformed into a subtler factor than the 5 FFs; this subtler factor is ectoplasm or crude mind . 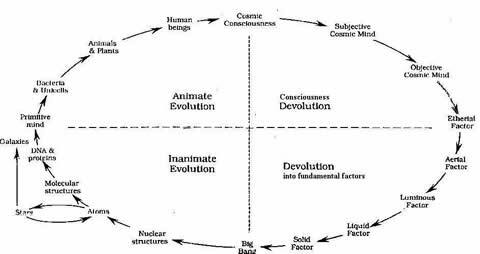 In this way, unit mind evolves from matter, as the origin of life; the mechanism of expression of life will be further elaborated later on. In the absence of the congenial environment of pranah, life does not get expressed. Then as the exterior force dominates on the physical structure (under the continuing pressure of the Operative principle), a stage is reached when there is explosion of the physical structure. As a result of this explosion, the physical structure gets disassociated into the five fundamental factors and its constituent solid structural portions explode into hot matter particles (of quark soup) which also contain the five fundamental factors. This explosion corresponds to the Big-bang. The hot matter particles, upon cooling, give rise to common particles, namely photons, neutrons, electrons and quarks. With further cooling, photons and neutrons begin to react to form deuterium, an isotope of hydrogen. Afterwards, the deuterium collects protons to form a helium nucleus. Then, the excess protons capture an electron to create common hydrogen. Thus this new Science Paradigm’s Cosmology theory explains (i) the formation of matter and visible universe (made up of the stars and planets) from explosion of the physical solid structure (ii) how the explosion occurs and (ii) what preceded the explosion (or Big-bang), which conventional physics is unable to provide. An explanation is also offered for the formation of the invisible matter made up dark matter and dark energy. Stage 2, Cosmology, the Birth of the Universe: Following this explosion (Big-bang), nuclear matter (protons, neutrons, electrons and other heavier particles) comes into existence, as the universe cools with expansion. Hydrogen and helium nuclei are formed, and later complete atoms, eventually resulting in stars and galaxies. Thus, the universe explodes into existence from a space-time singularity. Now this big bang explosion of the solid segments of the physical structure, due to the resulting exterial force acting on the physical structure (formed from all the five fundamental factors), results in the formation of the visible universe of galaxies. Likewise, from the disassociation of structures that are made up of only the other more subtler factors (such as the ethereal, aerial and luminous factors), we could have the development of the invisible universe of dark matter and dark energy, comprised of the particles associated with the first three fundamental factors. This is perhaps how the invisible universe comes into being, which again conventional physics is unable to explain. Stage 3, Release of Mind from Matter: In the earlier stage of the Cosmological cycle, the Cosmic mind emanates microvita, which can now energize matter to form ectoplasmic mind. How? (Figure 2). As the quantum of ectoplasmic mind-material keeps increasing, the inanimate physical structure concomitantly gets more and more energized into an animate (or life) structure, thereby providing the template of primitive life structures. Stage 4, Evolution: Further development of the above created primitive mind of primitive organisms (unicellular organisms and bacteria) into more complex organisms and then into plants and animals, due to the process of unfolding (or evolution) of unit consciousness and development of subtler layers of mind under the influence of Cosmic Consciousness. To express this development of mind, in turn requires more and complex nervous and anatomical structures. Eventually, the mind develops into a more complex and subtle mind of a human being. How can the human mind further develop so as to merge with the Consciousness (to complete the Cosmological cycle) is now explained below. As indicated above, there is an evolution of consciousness in us, which is the reason for making us conscious. Psychic Forces on the mind: There are two types of psychic forces acting on the mind of a person: a centripetal force towards the cosmic nucleus and a centrifugal force away from the cosmic nucleus. The centrifugal psychic force on the mind is caused by its interaction with the environment, and also due to the reactive momenta of the impressions on the mind caused by one’s interactions and behaviour. These impressions lend a characterizing property to the mind, which dictates the nature of its response to the environment, in the form of its behaviour and sentiments (such as joy or sorrow, kindness or anger). Psychic Rejuvenation (by mantras): Mental restlessness is due to the distracting effects of the propensities, seeking expression through the sensory organs, and thereby creating an imbalance in the mind. Since the propensities (or vrttis) are associated with malfunctioning by the psychic glands or cakras (or chakras), one can regulate the expression of the vrttis, and thus balance the mind by regulating the glandular secretion, how? By causing mental stimulation of these cakras, by means of (2-syllable) psychic (and acoustic) mantras, having the ideation of consciousness, we can help to overcome these propensities by dilating the unit mind to the cosmic mind, and thereby provide psychic rejuvenation. This process of concentrating on (and stimulating) the cakras by means of mantras, having the ideation of Consciousness, is called Meditation. Psychic imposition of Consciousness outlook on these cakras (or psychic glands or energy centers), by means of mantras, in turn draws positive microvitae, enhances the biopsychic force on the mind, and dilates the mind, as schematised in Figure 3. Now, when the mind gets dilated by this internal stimulation of these cakras (by means of mantras with the ideation of Consciousness, at the site of these cakras), these sentimental feelings and instincts are also controlled, and eventually get removed or defaced. This contributes to spiritual progress, aside from also contributing to one’s physical and mental well-being and health. 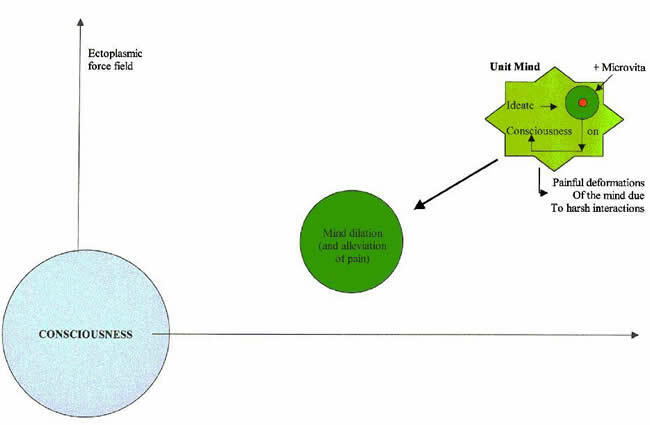 Figure 3: The figure depicts an individual (unit) mind in the ectoplasmic potential field of Consciousness. Ideation on Consciousness has the effect of attracting positive microvitae, which causes dilation of the mind, and rejuvenates it. This constitutes the basis of psychic therapy for behavioral disorders. 5. D.N. Ghista, T. Srikanthan, M. Veezhinathan, UR. Acharya, D. Guha, Home Healthcare Biomedical-Engineering and Yoga-Science Solutions: for Preventive and Managed, Fitness and Rehabilitation Care, in Distributed Diagnosis and Home Healthcare, eds. 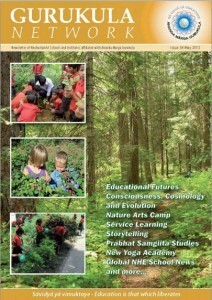 Acharya UR, Tamura T, Ng EYK, Suri JS, Lim CM, American Scientifc Publishers, Los Angeles, USA (Feb. 2009).